New Directions in Race Car Aerodynamics. Designing for Speed. by Joseph Katz. The first book to summarize the secrets of the rapidly developing field of high-speed vehicle design. 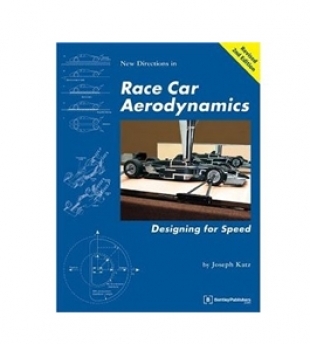 From F1 to Indy Car, Drag and Sedan racing, this book provides clear explanations for engineers who want to improve their design skills and enthusiasts who simply want to understand how their favorite race cars go fast. Explains how aerodynamics win races, why downforce is more important than streamlining and drag reduction, designing wings and venturis, plus wind tunnel designs and more.